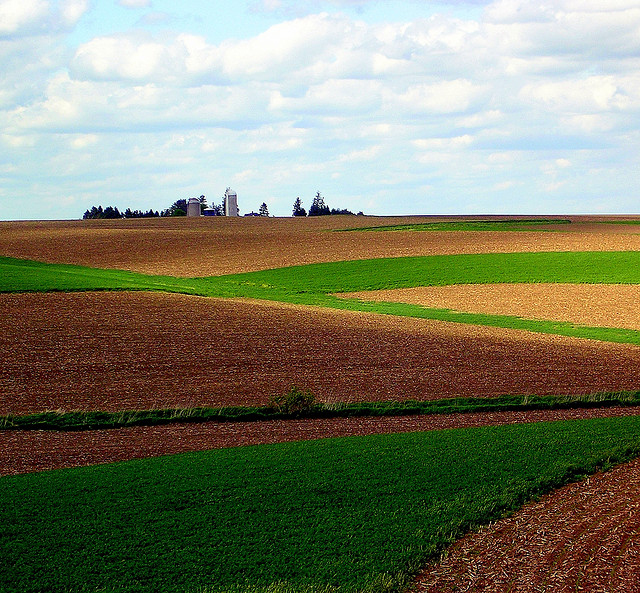 Iowa farm; photo by Todd Ehlers on Flickr (noncommercial use permitted with attribution / no derivative works). The Tama soil series is considered one of the most productive of the soils in Iowa used for agriculture. There are about 825,000 acres of Tama soil in east-central and eastern Iowa. The Tama soil series was first identified in Black Hawk County, Iowa, in 1917 (it has now been identified in 26 counties in Iowa). Tama soil is also found in Illinois, Minnesota, and Wisconsin. Tama soils formed under tall prairie grasses with a deep, fibrous root system; and under relatively humid climatic conditions. Over hundreds of years, the grasses have added organic matter to the soils, producing a relatively thick, dark surface layer. In some areas, erosion has significantly affected the properties of the soils. Eroded Tama soils have less total nitrogen and organic matter.